Little Miss Amelia joined our family on May 31st. It's been a blur of cuteness, lack of sleep, diaper changing and feedings since then and we couldn't be happier. 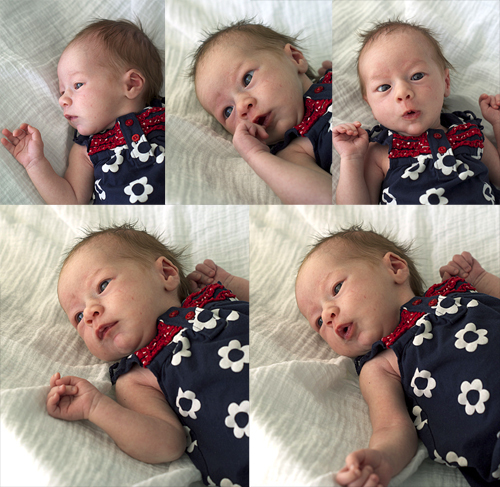 She happens to be the sweetest, cutest baby that ever lived, but we might be slightly biased. We're slowly getting the hang of this new parent thing, and once things settle down a bit I'll share some recipes that I've been cooking up. See you then! Oh my! Nicole! She is amazing! Congrats! And good luck catching up the your sleep. She is beautiful. Congratulations, and enjoy your time with your new little Miss Amelia. Oh my goodness, she is absolutely edible! What a precious little girl and a blessing to your life! Congratulations to you and your husband! She is a cutie...and of course, already has a great fashion sense! Hmmm...I wonder why...the Gardner ladies don't like shopping as far as I know... ;) Congratulations, she's precious! Congratulations - she's beautiful! So happy for you! Congratulations, Nicole! She is absolutely gorgeous! She is fantastic. Better than any old food! Beautiful name and baby girl. Congratulations. Pop over on Friday if you have a minute and check out the flip flops we are giving away. Wow! It doesn't get any better than that! What a cutie! Congrats!! She is beautiful and gorgeous! Hope you're settling in fabulously, Nicole! Just wanted to let you know that I recognized you as an awesome blogger in my today's post. Thanks for having such a wonderful blog!! This baby looks more beautiful than all the delicious food in this blog. I am suddenly missing my babies when they were this little. Hope you can post more pictures of your wee darling, Amelia soon. Awe....HUGE CONGRATS to you Nicole! She is just beautiful. I hope that you are doing well and enjoying your new role as mommy! TBH, I haven't been having much time to devote to blogging this summer either, but my excuse is not as good as yours! When I saw your post entitled Amelia...I knew I had to pop over and see your new bundle. Again...congrats! so very happy for you! Ooooh, thank you! I love your blog, too, and I'm excited to get caught up on reading it! Oooh,congrats to you two! That is so exciting. Hope your pregnancy goes smoothly!